To join a Fitness First club in the Middle East you must be 16 years old and above. To promote fitness as part of your lifestyle from early age we offer a Junior Membership with the supervision of a Personal Trainer or parent/guardian. Our Community Clubs have also family membership options where you can enjoy your time with your kids following our club guidelines and Child Care Policy. When I join can I use all Fitness First clubs? We've got hundreds of clubs worldwide, your Fitness First membership can come in handy when you're travelling internationally. Whether you're travelling for business or pleasure, you can visit a Fitness First club near you. Ask our reception team for an International Passport before leaving the country. What is an International Passport and how do I use it? The Fitness First International Passport enables you to access some of the 400 clubs around the globe when you travel. To obtain your passport, you can inform your home club prior to your departure. When you access a club overseas, you will need to present the International Passport and your active membership card. The passport is valid for 12 months from the date of issue and a maximum of 30 visits at international clubs is permitted. International fees might apply . Yes you can. We call our hold option - freeze. At Fitness First, we believe that exercise is a lifelong habit however we understand that sometimes you will need a break due to personal circumstances. To accommodate that, you can put your membership on hold for a minimum of 1 month by giving us appropriate notice. For further information, please refer to our reception team. A freeze fee will be charged. You will get most value from fitness when it's part of your everyday life. That's why we offer a 12 month membership as standard. We also have short-term options available as we recognise that circumstances don't always allow for such a commitment. We hope that you achieved your health and fitness goals, enjoyed your time as Fitness First member and benefitted from all the facilities offered as part of your membership. If you decide to continue your fitness routine away from our club, we are still here for you! You may cancel at any time provided you've reached your minimum contract period excluding any freeze period. Just before you leave us, we would like to remind you about some of the reasons to stay with Fitness First Middle East. There are some exciting fitness concepts you might not have tried yet, like XFit, our purpose built High Intensity Functional Training studio or MYZONE, an innovative tool to measure, track and review progress or The Swim Academy! We love to know what we're doing well so do tell us about your success stories, share your positive thoughts or tell us who in our team made a real difference! We welcome your feedback and we want to hear about ways we can assist you and answer to any concerns you may have. You can speak to any member of our club team or if you would prefer to speak with club management, please let our reception team know. If they aren't immediately available, they will ensure you are contacted as soon as possible. Alternatively, please email us your query and we will respond as a matter of urgency. Working out with a friend is more fun and helps keep you motivated. To bring a guest with you to the club, they will be required to sign the guest register and undergo a PARQ assessment prior to using the equipment or attending a GX class. Each guest can only visit the club once as your guest before they join as a member, but you can invite all of your friends and family to try our facilities as a guest. During special events held at your club, friends and family will be invited to attend for free. Guests can also enter the club by using a guest pass obtained externally or by paying for each visit. You have the flexibility of being able to workout any time, day or night. You can usually start exercising from as early 6am to as late as 11pm weekdays*, 7am to 9pm on weekends* and Public Holidays are generally 9am to 8pm*. It's best to check with your club for exact opening times. Do I need to pay for the Group Exercise Classes? Fitness First offers a wide range of Group Exercise Classes. Majority of our classes are included in your membership, however payment options might be subject to membership package and club locations. At Fitness First we believe in the power of habit creation and the benefits of training in a group. So that is why we have created a number of programs like Freestyle Group Training. Plus, we offer over 500 free group exercise classes every week ranging from Zumba, Yoga, RPM, Belly Dancing and the ever popular Les Mills classes like Body Pump, Body Combat and Attack. We have created a number of programs like TUFF, HardcoreMax and many more so you can explore new ways of challenging yourself! For specific timings and bookings please view our Class Timetable or contact your club. 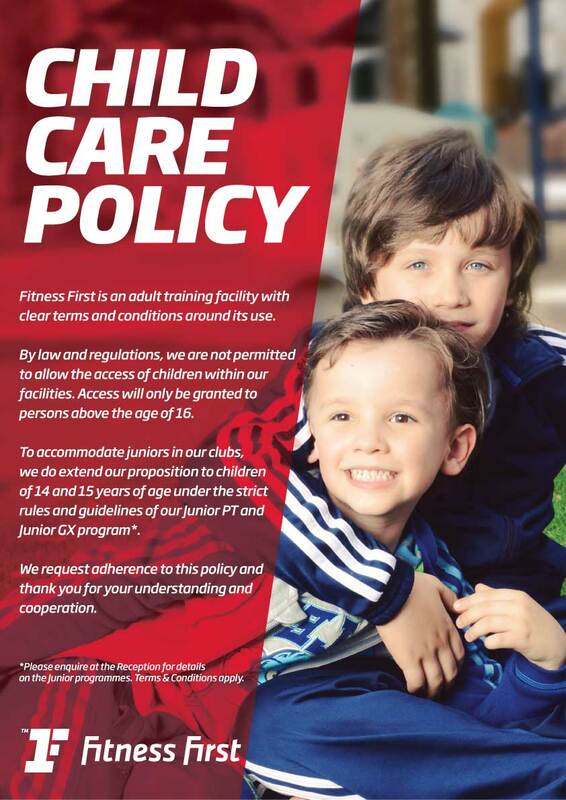 Fitness First is an adult training facility with clear terms and conditions around it's use. Our highly qualified fitness team is always available, happy to help you and answer your questions. You can find them on the gym floor or approach the reception for any help. Do I need to bring my own towel as a member? A bath towel and a small towel are provided at every visit where you will be asked to leave your membership card in exchange. It is recommended to wipe down the equipment after use so it’s sweat-free for the next user. Do remember to return towels to the designated collection bins/counter after use. Help protect our planet, be environmentally friendly by limiting use to one set per member/guest per visit. Our lockers are code operated with instructions found on the locker doors. For safety reasons, we ask our members to select different lockers with different codes when visiting the club. Note: lockers are only available for use during your workout and we will automatically open when the club closes in the evening. While care is taken to ensure the security of our lockers, we can't accept responsibility for items lost or damaged through theft or misplacement. For further assistance, please speak our reception team in the club.